OTTAWA, March 4, 2016 – A Montreal firm that designs fresh, contemporary houses inspired by the informal qualities of Montreal’s residential lanes is the recipient of the 2016 Emerging Architectural Practice Award given by the Royal Architectural Institute of Canada (RAIC). 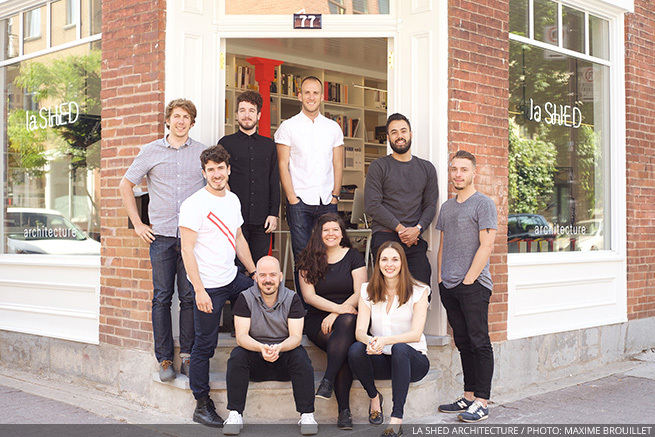 La SHED Architecture, a nine-person office, was founded in 2011 by Renée Mailhot, MRAIC, Sébastien Parent and Yannick Laurin. The trio graduated in 2008 from the University of Montreal, where they met. Their work includes free-standing houses and house additions in tight urban contexts as well as small commercial projects and vacation properties. The award will be presented at a ceremony at the RAIC Festival of Architecture, which takes place in Nanaimo from June 8 to 11. For three years after graduation, the founders interned at larger firms, while spending evenings and weekends on la SHED projects. They shared a triplex and worked from their living rooms, passing files and computers from one floor to the next. When they obtained their architects’ licenses and had enough contracts to keep busy, they devoted themselves full-time to la SHED. The firm’s name alludes to its work, which expresses the eclecticism of the alleyways shaped by the old storage structures typically found behind Montreal homes. Located in a storefront, the studio aims to bring architecture closer to the general public, where designing a personalized living space is not a luxury but an accessible service. “La Shed has found a way to produce great work in a market in which architectural success is often elusive – the small home renovation,” said RAIC President Allan Teramura, FRAIC. François Cardinal, 2015 recipient of the President’s Award for Media in Architecture, journalist at La Presse, Montreal.